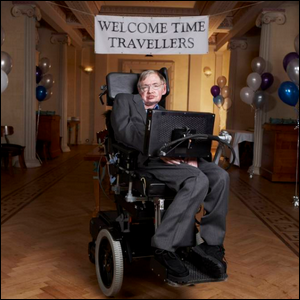 Stephen Hawking Made Headlines When He Threw An Unconventional Party For? Bubble Wrap Was Originally Invented To Serve As What? How do you throw a party for time travelers? If renowned scientist Stephen Hawking’s technique is the template, the process is pretty easy. The first step is to throw the party (like Hawking did in 2009). The second step is to wait until after the party is over to send out the invitations. If your plan goes off smoothly enough and the laws that govern time and space in our universe are accommodating enough, a very curious thing will happen: your guests will show up before the invitation is issued. We are all travelling forward in time anyway. We can fast forward by going off in a rocket at high speed and return to find everyone on Earth much older or dead. Einstein’s general theory of relativity seems to offer the possibility that we could warp space-time so much that we could travel back in time. However, it is likely that warping would trigger a bolt of radiation that would destroy the spaceship and maybe the space-time itself. I have experimental evidence that time travel is not possible. I gave a party for time-travelers, but I didn’t send out the invitations until after the party. I sat there a long time, but no one came. Perhaps Professor Hawking is right, time travel may simply not be possible. Or, if you want to take a generous stance on his failed experiment, perhaps it isn’t that time travel is impossible, but that the experiment didn’t play out the way one might anticipate. Perhaps the message simply didn’t persist long enough for anyone to get the invitation in the future (maybe somebody should have carved the invitation into a large stone obelisk). Maybe it did work, but not in the timeline/dimension we exist in—maybe a different Stephen Hawking got to party with some really cool people from 4058. Or, perhaps, time travel will prove to be an imperfect science and instead of ending up in a hall at Cambridge to drink with an esteemed 20th century scientist, they transported themselves directly into the middle of a prehistoric volcano and that was, ingloriously, that.